Polo GT and G40 Digifant remapping. Aftermarket ECUs (e.g. Emerald) also catered for. On the road, or dyno options available. See the services page for details. Fault codes read, cams timed up, ignition timing set, running problems diagnosed. Bigger MAP sensors fitted to G40 ECUs for running over 1bar/15psi of boost. 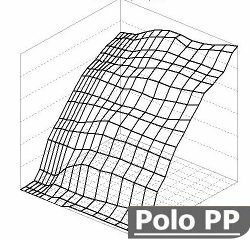 Polo G40 1272cc ‘Entry Level’ chip- fuel map calibrated to accommodate extra boost from a 65mm pulley whilst retaining standard injectors & engine components. Polo G40 1272cc chip- an aggressive ignition map allows for an uprated camshaft to make the most from a ported supercharger and 65mm pulley, this chip requires accurate set-up of ignition timing. Polo G40 1272cc chip- for owners who are reaching the limits of standard injectors. This map allows larger 250cc/min units to be installed- as recommended for 165bhp+ Recommended modifications are; ported supercharger, 65mm Pulley, larger intercooler, colder spark plugs. Polo G40 1341cc chip- Designed as a ‘safe’ map with a conservative ignition map and generous fuel map it is perfect to run-in and set-up a freshly built 1341cc conversion. 250cc/min injectors need to be used with this chip. Polo G40 1341cc chip- A proven 170bhp+ has been achieved with this specific map. Calibrated to suit uprated 250cc/min injectors, 4-branch manifold, cylinder head modifications, aftermarket exhaust, large intercooler, aftermarket camshaft, 65mm pulley, ported superchargers etc. Polo G40-turbocharged 1341cc chip- As above with altered parameters to suit a 6psi boost switch replacing the standard G40 WOT switch, giving a smoother more progressive drive. Polo G40-turbocharged 1341cc chip- For an uprated MAP sensor & Boost Switch, suitable for up to 22psi of boost from a K03. Turbo specific camshaft, uprated intercooler, Aquamist, 310cc/min injectors and a Forge Actuator are required. Proven at over 200bhp and 185lbft! Polo GT chip suitable for standard cars or those with minor modifications, e.g. 4 Branch, Uprated Air Filter, Ported Throttle body. Raised rev limiter to make the most of a GT short ratio gearbox.